Ayahuasca vs Yage vs Daime - What's the Difference? Ayahuasca, Yagé, Daime – three different names for a powerfully visionary tea consumed primarily in the northwestern region of the Amazon Basin, where Colombia, Peru, Ecuador, and Brazil come together. But are they three different names for the same plant medicine recipe? Or are they different? If so, how? This is a very simplistic way to look at it, but makes for easier remembering. If you are in the camp of people who believe that the visionary effects of the brew can be influenced by the songs, prayers and intentions that go into its making, this explanation will make complete sense. This may be partially and inconsistently true. More on this below. Archaeological studies suggest that it may have been used ritually for more than 5,000 years, but it is found in origin histories for all our peoples. For our civilizations, the sacred medicine has been the source of our knowledge, identity, and culture since the creation of the first person. Consequently, it is always present in our songs and histories, as well as being part of the ancient relations between our peoples. While it’s easy to say that “Daime”, the name given to the caapi and chacruna tea blend made by the followers of the syncretic Brazilian Santo Daime church, is “ayahuasca from Brazil”, the indigenous tribes in Brazil have their own names for their caapi containing potion, such as uni, nixi pãe, caapi, and camarampi. Ayahuasca (as most people know it) and Daime are made of the same plants, Banisteriopsis caapi (ayahuasca) vine and leaves of the Psychotria viridis (chacruna) shrub. However, ayahuasca can be made with the addition of other plants, and still be called “ayahuasca”. Also, anyone making ayahuasca can use a different leaf to vine ratio, whereas Daime has a set recipe, and tends to have less leaf, and lower DMT, than Peruvian ayahuasca. Most importantly the two brews are imbued with different spiritual energies, and are in fact different spiritual beings, accessing different realms. I have each if these plants in my garden and am coming to know them well. Daime tea follows a strict recipe and brewing process. Traditional Daime tea only contains caapi and chacruna, and is typically made by the Santo Daime church community in a “feitio”, which is also a spiritual work. A feitio might last between 5 days and 2 months, the duration of which can be dictated by the amount of plant material that needs to be processed, and how many people are participating in the feitio. Typically the men process the “cipó”, or vine, and the women process the “rainha” or leaves of the chacruna shrub. The work is conducted both in silence and with music, either singing collectively or listening to recorded Santo Daime hymns, because there is no way everyone can keep singing nonstop for days, says Daimista Bruno Saravia C Castro. The participants of the feitio decide what songs are sung or played. The church leader, typically the Padrinho, decides what kind of tea is made. If tea is being made for a normal work (ritual, session) it will be at a concentration that allows people to function, that is to say, read from their hymnal, sing, dance and shake their maraca in a highly coordinated way. If they are making tea for a “cura”, or “healing” type of work, the tea will be stronger, and more purgative. The Santo Daime churches also follow a grading system that allows them to create teas of different strengths, to support different types of spiritual works. I remember, when I was living in Mapia, a Daimista explained to me their Daime grading system, and how it was determined by the proportion of liters that were boiled down to achieve the end result. For example a tea whereby 3 liters of liquid was boiled away to yield 1 liter of medicine was stronger than “dois por um”, or 2 to 1. The strongest, most concentrated teas get reduced down to a thick, syrupy, “mel” or honey, which could send you on a hours long journey with a single teaspoon. I asked Rob Heffernan, my go to expert on all things Daimista and the legal status of ayahuasca, for clarification on the grading system. Rob has been involved in the Peruvian curandero tradition and the Santo Daime for the last 19 years. He is a founding member of Chacruna’s Council for the Protection of Sacred Plants. Grades of strength in the Daime are called degrees: Mainly 1, 2, 2:1 3:1 and “mel”. Yet, there are variations within these degrees. These will have special markings on them. The key thing is that if you know the strength of the degrees from a given feitio you can have a good idea how to titrate the dose because they will be consistent. 3:1 will always be strong. Yet you can’t really say that a 3rd degree from a feitio in Mapia, a feitio in Sao Paulo or a feitio from another part of the world will be the same. That is why having an experiential knowledge of the strength from a specific feitio is important. In Colombia where they call the psychoactive brew “yagé”, the brew is often made with ayahuasca vine and one of a family of vining admixture plants commonly called chaliponga, known scientifically as Diplopterys cabrerana. Diplopterys cabrerana is a vine native to the Amazon Basin, spanning the countries of Brazil, Colombia, Ecuador and Peru. In the Quechua languages it is called chaliponga or chagropanga; in parts of Ecuador it is known as chacruna, however this is the a name otherwise reserved for Psychotria viridis. Ayahuasca is feminine and often referred to as “madre” or “grandmother”. Yagé in Colombia is considered to be masculine, and a grandfather lineage. Both chacruna and chaliponga are rich sources of N,N-DMT, a tryptamine endogenous in humans, and other plant and animal species. Some say chaliponga gives a more visionary experience to the brew than chacruna, and there is speculation that this is because chaliponga produces trace amounts of 5MeO-DMT and bufotenin. Does Chaliponga Really Contain 5-MeO-DMT? There is debate as to whether chaliponga indeed contains 5-MeO-DMT, and that this claim is misinformation being shared and repeated online. So I reached out to my friend Julian Palmer, the person who “invented” changa, and my goto expert on all things DMT. He directed me to a post by Bancopuma in the 5-Hive Forum, 5-MeO-DMT not likely contributing to effects of Chaliponga/Diplopterys cabrerana. It is quite common to hear tales of the presence of 5-MeO-DMT in the ayahuasca admixture plant Diplopterys cabrerana, aka Chaliponga, with some people being adamant this is what gives rise to its perceived unique effects, with others questioning whether it is safe to mix it with an MAOI in the form of ayahuasca vine. Looking at the scientific literature and some more recently analyses, it is clear that 5-MeO is not playing a role in the effects of Chaliponga. However a fair portion of users of this plant do find it distinct in effect compared to other ayahuasca admixture plants like Psychotria viridis and Mimosa tenuiflora. – DMT and traces of bufotenine found, but 5-MeO-DMT not found (McKenna 1984). – 0.4655% DMT, co-occurring with traces of NMT, Bufotenine and MTHBC (Agurell et al. 1968) (misidentified as Banisteriopsis rusbyana see Gates 1982). – 0.16638% DMT, 0.0035% MTHBC and 0.0035% 5-MeO-DMT in dried stem (Agurell et al. 1968 – see attached paper) (misidentified as Banisteriopsis rusbyana see Gates 1982). Bancopuma also mentioned that a DMT Nexus member endlessness performed a GC-MS analysis on a sample of D. cabrerana leaf, reputed to be a source of 5-MeO. None was found. He goes onto share that chaliponga contains much more DMT as well – 10 grams of chaliponga should contain about 100mg of DMT. Whereas, to get 100mg of DMT from chacruna you might need 50-100g of plant material. Furthermore, chaliponga is more consistent, to the point where some of the curanderos around Iquitos would go up to Ecuador to collect plants because they like it better for their ayahuasca brew. So Why Is Chaliponga “More Visionary” than Chacruna? Those who strongly advocate that it’s impossible to truly ID what’s in a brew because of the visionary qualities, because it entirely depends on “you” (that it’s entirely subjective) and not what’s in the plant medicine potion will likely insist that it chaliponga is not more visionary than chacruna. But for those who experience more and longer visions with chaliponga brews, could it simply boil down to chaliponga having a higher concentrations of DMT? 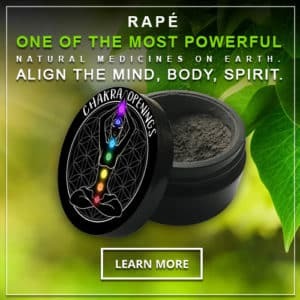 I find chacruna to generally not be a good DMT source. Sciencey people will tell you that DMT is DMT and so it must be the same, whether it is synthetic or from different plants and any differences in effects must be subjective. That is however incorrect and becomes highlighted if you have access to many sources of DMT plants like we have in Australia, that contain a pure source of DMT. The differences between them are very vast, and I’ve never really found chacruna to be comparable to the acacias or chaliponga. Jonathon Miller Weisberger, an enthnobotanist who spent many years living among the indigenous tribes of Ecuador, wrote extensively about plant-based medicine and indigenous science of the Upper Amazon, in his book Rainforest Medicine. Like the indigenous tribes of Colombia, the Secoya of Ecuador that Jonathon got to know call their medicine yagé. Ayahuasca is usually prepared leaving the bark on the vine and is only slightly rasped and pounded. Like this the vine will be boiled, thereby leaving more tannins in the brew and gaining a more powerful purgative effect (i.e. it makes one vomit). Yagé is prepared by pounding off all the bark and leaving only the woody bone of the vine to be boiled. Consequently these brews have far less tannins and cause less vomiting. He goes onto describe the yagé practices of the Secoya indigenous tribe of Ecuador, who consume their medicine in a particular way that is distinct from how ayahuasca is typically consumed. Watch Jonathon’s video, to go deeper into the traditions and legends of ayahuasca and yagé. The process that the Secoya follow in brewing their yagé is also described in detail here. Could You Discern Ayahuasca, Yagé or Daime in a Blind Taste Test? If you were to take four bottles; an ayahuasca analog, yage, ayahuasca and Daime, shake them up, put wine bottle socks on them (all the same color) mix them up for 60 seconds in the dark, turn the lights on and serve, I’m willing to put 1K on the table in cold hard cash that no one could tell the difference or choose what bottle was what…That pretty much settles the questions: yes, Daime is ayahuasca, prepared a little different, but, at the end of the day its the vine and leaf….Ultimately, its your call, but pre-suggestions, beliefs and imagination need to be kept null if you are to get a practical-answer: set & setting colors the experience, whereas, as the tea is identical, the mind and imagination’s pre-prompting isn’t: that’s the key to the difference, it isn’t in the tea, its you in the tea, your mind’s eye, heart and expectations. But does this really render the plant medicine potion to be “identical” across the board? And this takes us back to Daiara Tukano’s perspective. There are many names for the tea, these names are significant to the history and identity of the different tribes that traditionally consume this plant medicine, and indeed the differences do matter. According to the World Ayahuasca Conference blog, it’s important to understand that there are many different names for the same, or similar blends of ayahuasca tea, and that that each name has cultural significance. Anthropologist Luis Eduardo Luna, in his thesis Vegetalismo, lists 42 names for the ayahuasca brew or the Banisteriopsis caapi vine. (He doesn’t distinguish between the two. ), while ethnologist Frederick Bois-Mariage, PhD, on his ayahuasca blog, also lists 19 names just for the B. caapi vine from Panama, Colombia, Peru, Ecuador, Brazil, Bolivia, and Venezuela. Regionally, regardless of what’s other plant admixtures are in the brew, even if Colombians made their yagé with chacruna it would still be called yagé. Similarly, if Peruvians use chaliponga the brew is still called ayahuasca. The terms ayahuasca or yagé do not change regardless of other additives like brugmansia or even if the brew is only made with B. caapi and water. Ayahuma bark: Dead head tree. Provides protection and is used in healing susto (soul loss from spiritual fright or trauma). Capirona bark: Provides cleansing and protection. It is noted for its smooth bark, white flowers, and hard wood. Chullachaki caspi bark (Brysonima christianeae): Provides cleansing to the physical body. Used to transcend physical body ailments. Lopuna blanca bark: Provides protection. Punga amarilla bark: Yellow Punga. Provides protection. Used to pull or draw out negative spirits or energies. Remo caspi bark: Oar Tree. Used to move dense or dark energies. Wyra (huaira) caspi bark (Cedrelinga catanaeformis): Air Tree. Used to create purging, transcend gastro/intestinal ailments, calm the mind, and bring tranquility. Shiwawaku bark: Brings purple medicine to the ceremony. Uchu sanango: Head of the sanango plants. Huacapurana: Giant tree of the Amazon with very hard bark. …it’s not hard to view ayahuasca as a world, not a medicine.